Nintendo is having a hard time getting gamers to purchase the Wii U game console. One of the big reasons for this trouble is that there aren’t many third-party games available because some major game developers are avoiding the console altogether. Nintendo is gearing up for the holiday season and has announced a price cut for the Wii U. The new price for a standard Nintendo Wii U game console bundle is now $299.99. The price includes the Wii U console with 32 GB of storage, GamePad, Stylus, sensor bar, and the Nintendo Land videogame. 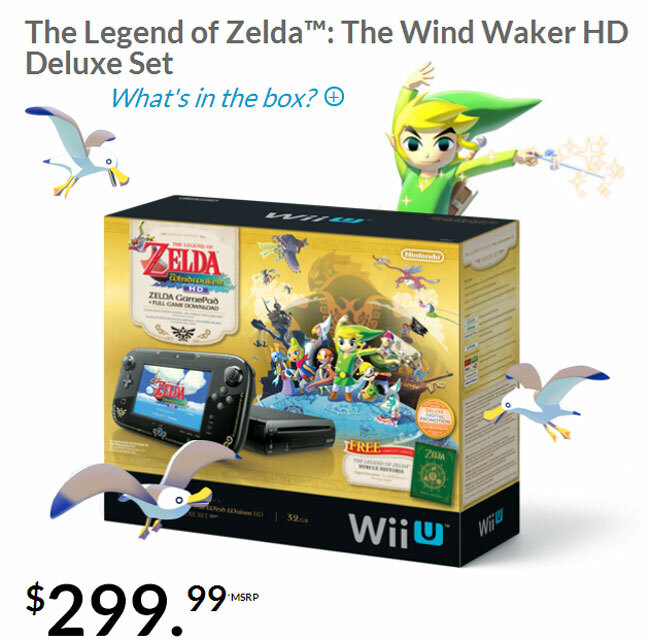 A bundle featuring The Legend of Zelda: The Wind Walker HD is also available for the same $299.99. The Zelda hardware bundle features the console, a GamePad with golden Zelda accents, and all the other accessories included with the basic bundle I just mentioned. The big difference is this console comes with the Zelda game rather than Nintendo Land. Both of these consoles are available to purchase in the US right now via multiple online in retail outlets. I don’t think this price cut is going to help Nintendo perform very well this holiday season with the Xbox One and PlayStation 4 both launching.